I have a watercolor card to share with you today. You're not getting tired of water coloring, are you? I hope not, since I'm having so much fun experimenting with different ways to watercolor! I know, that sounds wierd since it's a "sympathy" card. This card for an artistic friend who recently lost her husband after a long illness. 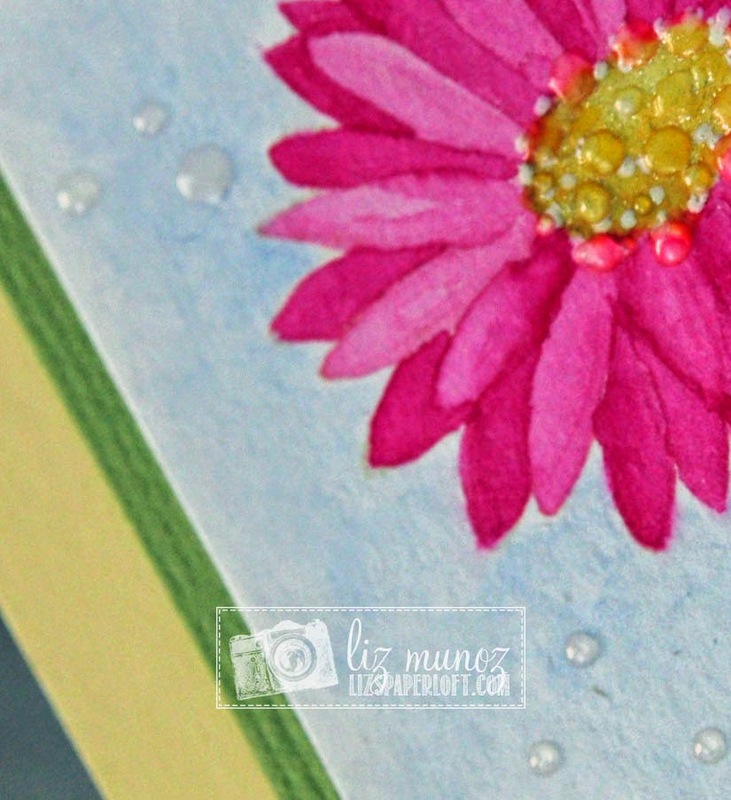 For this card, I stamped the flower using Tim Holtz Distress Ink, then I used Stampin' Up marker (regular ones) to do the water coloring. I think that most any water based marker would work. After everything was dry, I added drops of glossy accents. What a gorgeous card Liz!!!!! 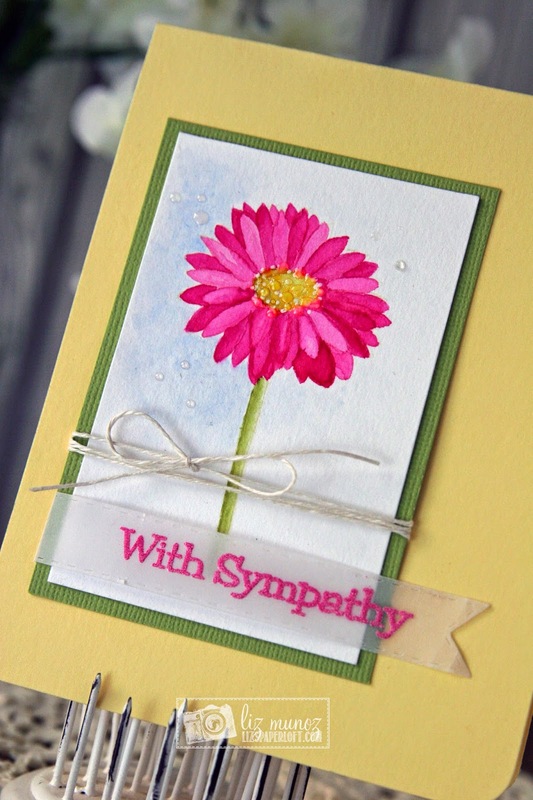 So sorry you have to make a sympathy card but I know your friend will love it! Happy Friday!! Hope you have a GREAT Easter weekend! Stunning! I think your friend will love it. 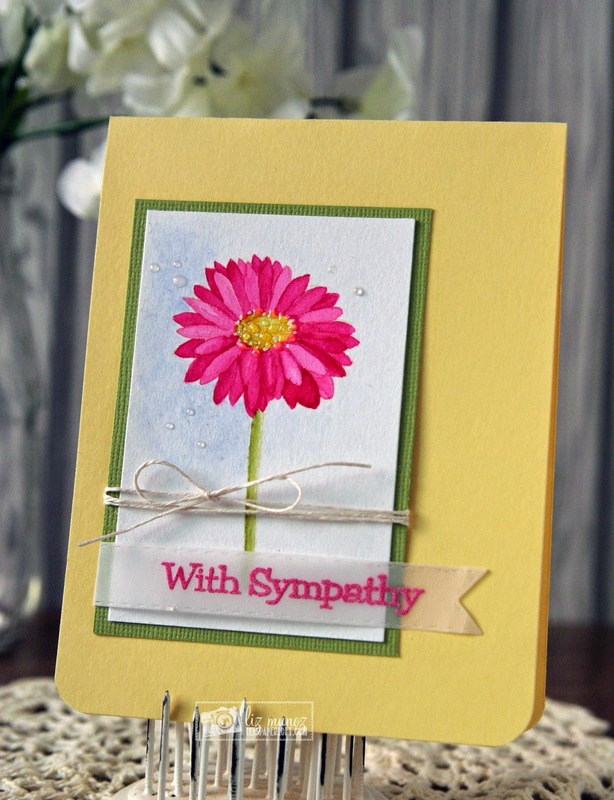 Your sympathy card is beautiful Liz! The watercolor looks fantastic and love the pretty flower. So you had to make a sympathy card but I am sure your friend appreciated it. Such a beautiful sympathy card. I am not tired of the water coloring...so many different techniques and looks. I really like the glossy drops. So pretty! Liz ~ nope not getting sick of seeing water coloring!! I am still practicing here but you my sweet friend have MASTERED it!! BEAUTIFUL!!! I absolutely love how that flower came out, beautiful, love the drops of glossy accents!